The tiny black and white photo is Nic Nicosia’s film still from his ‘Middletown’ video (1997). If Nicosia happens to stumble on this site, I hope he won’t mind how I decided to hang this little piece. If you live in Dallas and want to see and know more about his work, visit the Talley Dunn Gallery. The corner setup. For quite some time my new living room couch has been waiting for some company. I’m referring to the need of additional furniture. 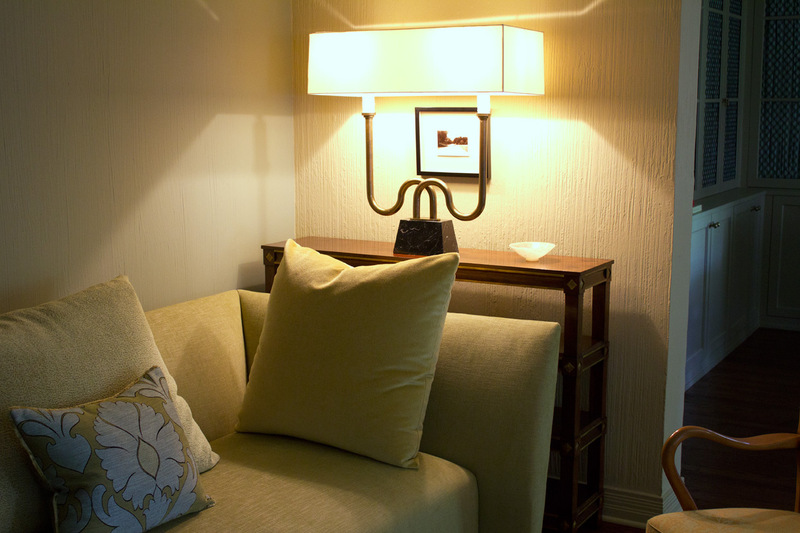 Well, now this corner is complete with the introduction of a tiered side table and a vintage lamp. I have always loved the way the Parisians have used modern furnishings in their seventeenth and eighteenth century apartments. The ornate boiserie of the walls mixed with the clean lines of the furnishings compliment each other. In adopting this concept for my own home, I’m hoping to avoid the petit bourgeois trap that I fell into in the 1990s. The following photo is of the same corner but with the lamp on. Because the lamp skews the colors, I chose not to use it as the first and main photo. As you can see, I have no artwork on the adjacent wall yet. But don’t worry, when I do find a contemporary piece that I love, it won’t be because it matches the sofa. This is a marvelous moment, Patsy Ann. That lamp is to-die-for. I have never seen another like it–and the rectangular shade is perfection. 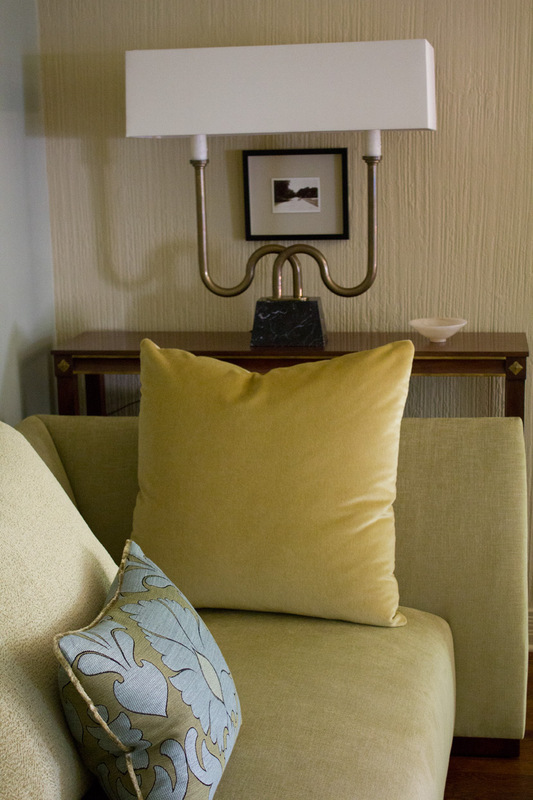 The angles combined with the softness of the butter-yellow pillow are a grand juxtaposition. Is the tiny bowl opalescent or milk glass? Gorgeous. Clean. Edgy, yet absolutely comfortable. Thank you, Margaret. The tiny bowl is some sort of highly polished alabaster-like stone. It might even be compressed glass. I like to burn Italian alter papers in it.